It is safer for them as no ice or pools of water can form. All of Wonderlawn’s installations include a sub base which allows for proper drainage. It will save them money and time, not having to feed, mow or tend to the lawn every month. The grandchildren will love it too! No muddy shoes in autumn, no pools of water and ice in the winter. And the best thing, no mud on your snowman! The lawn won’t die in the cold! Many lawns can be irreparably damaged during the winter months, leading to mud patches in the spring and summer. A fake lawn by Wonderlawn will never die like this. When is the best time to install artificial grass? So you’re thinking of installing artificial grass, or having it installed for a relative. Great choice! You’ve come to the right place! You may be wondering when is the best time to install artificial grass? Here are our top 5 tips of when is the best time to install artificial grass. Tip 1: Install your artificial grass out of season. Artificial grass seems to be installed mainly in spring and summer, but it doesn’t need to be. It’s an all year product, so you can use it in the rain and snow, just as easily as you can in those hot summer days. 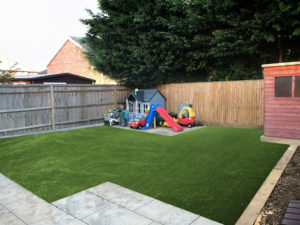 As customers think you can only install artificial grass in the summer, they tend to opt for those months, but there really is no need to install then. Installing in Autumn and winter may also be easier, as removing the older grass is easier when slightly damp, rather than a tough dried out summer lawn. Tip 2: Do you have drainage problems on your lawn? Is your lawn uneven and full of puddles when it rains? Does rain sit on your lawn? If you have lots of clay under your lawn, water can just sit on the surface leaving it waterlogged. Combine this with snow melting, or water freezing and your lawn can quickly become a muddy quagmire when wet, and an ice rink when frozen. Installing artificial grass by Wonderlawn will make your grass look wonderful all year round, but all of our installations come with professionally fitted base work. Which means you will get proper drainage on your lawn, no matter what’s under it. If you have drainage issues, speak to one of our installers by clicking here and they will be able to discuss with you how your artificial lawn can drain correctly with a Wonderlawn installation. 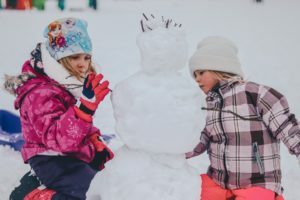 Your artificial lawn should be an all year round surface, so that’s sunbathing in the summer to building snowmen in the winter. Your artificial grass can do it all, without the mud, dirt and puddles of a traditional lawn. Tip 3: An artificial grass installation can save you money AND add value to your property! I’m sure you’re aware that installing artificial grass means no longer cutting your lawn. No more feeding it, no more trimming the borders. This cost over the life of a fake lawn soon mounts up. You’re also saving your own time. Once the installation is in, you can just enjoy your garden. It’s that simple! Potential buyers of your home in future will look at an artificial lawn as an investment for your property. It allows the garden to be used year round so you essentially gain another room on your property. Tip 4: Will my plants get damaged in an installation? If it is a professional Wonderlawn installation, then no. We take great care in all of our installations and make sure no mess or damage is left on site. Winter is the time of the year when your garden will be least active. For our installation teams this is great, there will be fewer overhanging plants and shrubs, making access to your lawn easier and it’s edges. It’s also the time of the year when you spend very little, if any, time in your garden, so if it looks like a building site for a day while the installation is taking place, that isn’t a problem. Once the site is cleaned and the installation complete your garden will look like new again. Tip 5: The only down side to a winter installation is that the days are much shorter. This means work will have to stop at around 4pm most days. The good news is that most of Wonderlawn’s domestic installations take half a day to a day, with only extreme cases (huge plots of land, or intricate landscaping work) taking longer than this. Please speak to your local installer about how long your installation will take for more information. An artificial grass installation can be performed at your choosing, but there really is no single ‘best’ time of the year to have your lawn fitted. It really depends on when is best for you. So speak to your local Wonderlawn installer today and they can work with you to choose the best time. One final thing, our network of professional installers find themselves busy throughout the entire year, but lead times will likely be shorter in autumn and winter. So if you want to take advantage of our buy now, pay in 12 months option, now is the time to give us a call to discuss your new lawn 03337006000. You can also request your free samples of our Luxury, Superior, Naturalle and Urban Play artificial grass products by completing our free samples form.